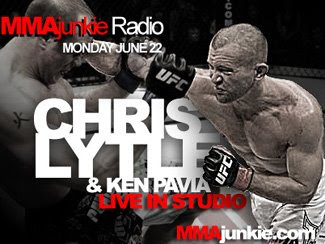 Chris Lytle, who defeated Kevin Burns at The Ultimate Fighter 9 Finale in a co-"Fight of the Night" bout, is an in-studio guest with his agent, Ken Pavia, on today's edition of MMAjunkie.com Radio. Also slated as a guest is "GP," whose winning entry for The Sunday Junkie focused on "The Ultimate Fighter 9." Catch MMAjunkie.com Radio Monday-Friday at 12:05 p.m. EST (9:05 a.m. PST) live from the Mandalay Bay Resort & Casino's Race & Sports Book. Listen to and watch the show at www.mmajunkie.com/radio.